Gideon B. Smith of Baltimore, Maryland, was not really a birder. Nor was he an ornithologist. He was into silkworms, and made much of his money as one of the first Americans to import the little caterpillars with the cocoons made of money into the United States. So it’s probably ironic that his name is applied to such a range-restricted and cryptic species, a true birder’s bird. But Smith did have one thing going for him in the race to ornithological history. He knew people. One person, in particular. The great artist John James Audubon, whose influence on North American ornithology cannot be understated. Audubon needed investors if his magnum opus was to become a reality, and Gideon Smith was one of them. One of the very special gifts Audubon offered to those investors, sort of his version of the ubiquitous PBS totebag, was the opportunity to have one North America’s birds named after them. I don’t know whether Smith was in for a lot or a little when Audubon named this bird, of all the birds of the American west, after him. But perhaps Smith would appreciate the difficulty birders have to go through to get a good look at his namesake, particularly on its wintering grounds. 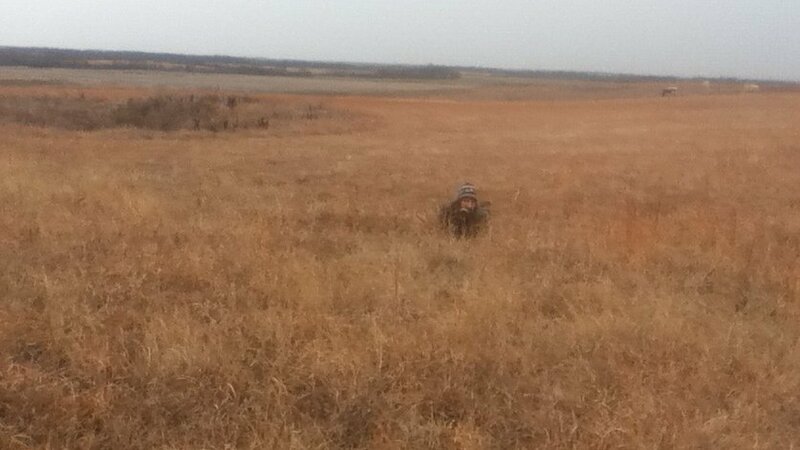 The holidays found me back in southwest Missouri, and the opportunity to bird was one I was looking forward to taking. It’s funny, when I think back on my time as a kid birder in the Ozarks, how obsessed I was with eastern birds. I spent an inordinate amount of time chasing down eastern migrants in the fall and spring, and dreamt of warblers and vireos and flycatchers who are generally on the western frontier of their ranges. Now, as I look back on that part of the continent from my current home in the southeast, I find that the much more interesting birds are those who reach their eastern boundaries on the edge of the prairie in western Missouri. And when I’m back home anymore, that’s where I go. 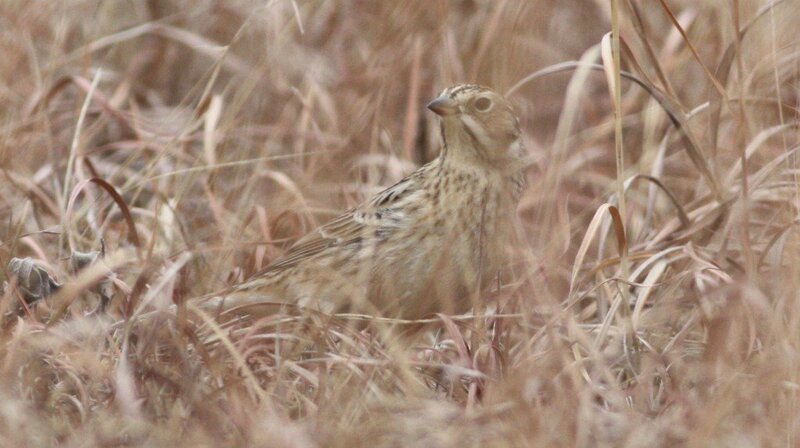 Smith’s Longspur, spirit bird of the aforementioned silkworm magnate, was my A-1 target this time around, so my dad took me out to Pennsylvania Prairie in Dade County. 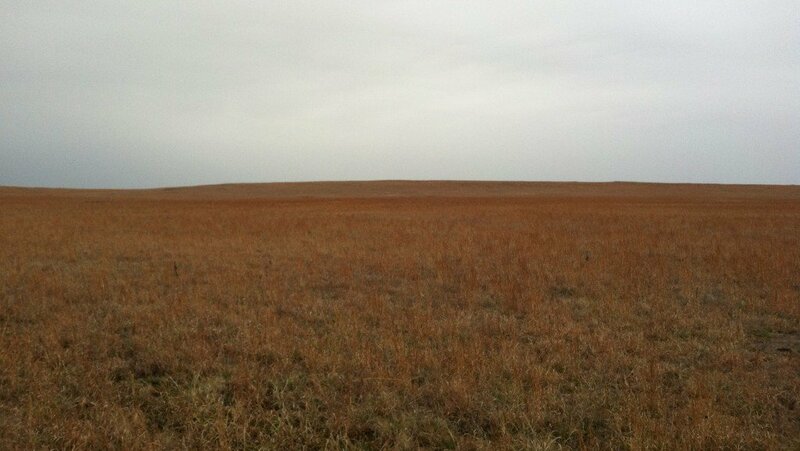 The site is managed by the Missouri Prairie Foundation, a non-profit seeking to restore native grassland across much of the state, and is as nice an example of pristine Missouri grassland, if a bit on the small side, as I’ve ever seen. And fortunately, the birds are not super difficult to find. You just head up to the top of the ridge and walk back and forth until a small flock of sparrow-like birds with buffy bellies and white outer tail feathers pops up and, making a dry rattling vocalization, heads out over the prairie to god knows where. This is generally how birders pick up their life longspurs. But I’m a glutton for punishment, and I had a mind for photographs so my dad and I had to improvise another plan. Instead of flushing the birds up, sending them looping all the way to the other side of the prairie, we had to arrange it so that they’d pop up (allowing us to note where they were) and immediately drop back into the grass. So after flushing them initially, sending them a quarter mile distant, we had to note in the featureless grassland where they landed and run, as fast as we could, to within 10 meters of that spot, at which point we’d crouch and walk slowly towards where the birds are. They’d spook then, but not far. Once they settled again, I’d drop on my belly and army crawl until I found the bird in the grass. This took about three times to perfect this system before a bird sat still long enough for me to find it. 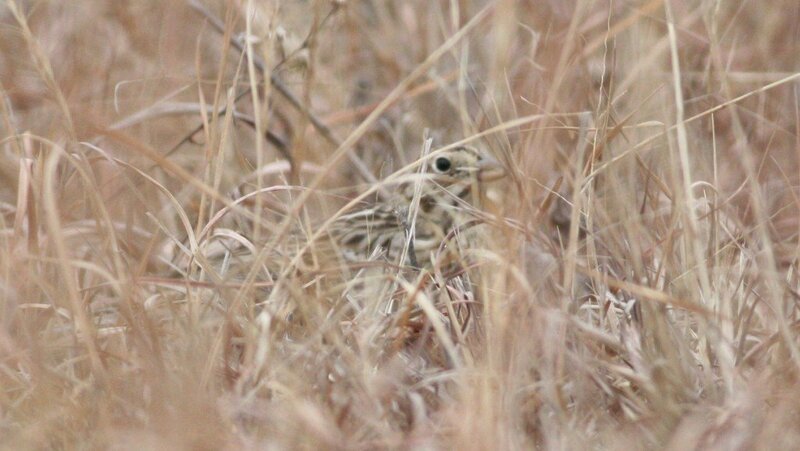 The grass is about ankle-high, and the longspurs move like mice. But if you can pick one out of the blonde colored grass, you can usually get pretty close before it flushes again. This one hung close to a seep in the lower part of the prairie. I laid there, waiting for it to finally move out into the open a little bit. Slowly the bird made its way towards something a bit less dense, pausing to look in my direction every time my camera shutter fired. At every point I’d say to myself, “this is probably the best you’re going to get”, but it kept coming closer and closer in my direction, weaving between dry grass stalks until it stopped no more than 10 feet from my face. Smith’s Longspur is a subtle bird, but you can still see the faint remains of that amazing summer pattern that really only visitors to the high arctic get to enjoy. Also, I really like the way the bill appears to curve upwards, not something you see very often, if at all. Not long after this, something caused the bird to finally flush back towards the top of the ridge where we’d originally found them. Not a bad encounter with this specialty bird of the southern plains. And despite the name, one certainly better than any silkworm pusher from Baltimore ever got. This would be much more impressive if you had been stalking a lion. Of course, that might just be my hatred of Smith’s Longspurs coming through. Speachless … just … deprived of words. Sweet bird and a great explanation of how you approached the subject with photos in mind – well done, Swick, well done. @Corey- Don’t hate, Corey. If you ever find yourself in southwest Missouri, and I don’t know what you would, now you know where to go. @Christopher – Thanks! I had to work hard for those photos, I don’t mind saying. 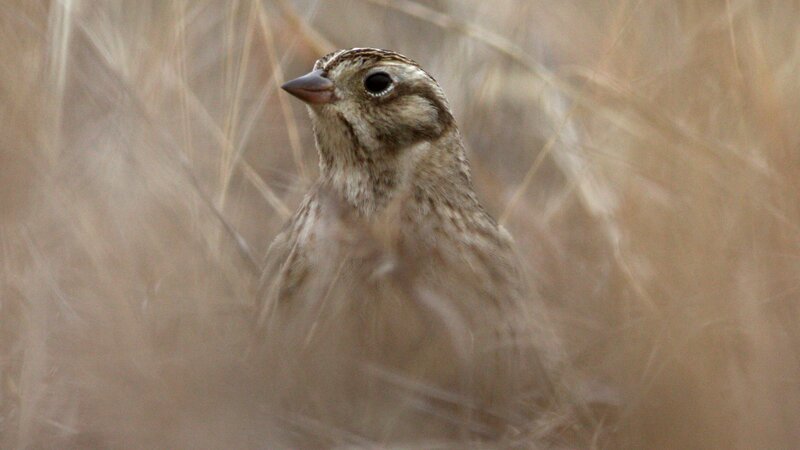 This reminds me of how we look for Nelson’s Sparrows in Montrose Dunes in Chicago! Great read. Thanks for sharing!